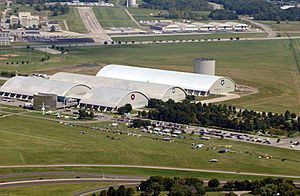 The National Museum of the United States Air Force (formerly the United States Air Force Museum) is the official national museum of the United States Air Force and is located on Wright-Patterson Air Force Base, near Dayton, Ohio. Over 400 aircraft and missiles are on display, most of them indoors. Admission is free. The museum has many rare and important aircraft and other exhibits, including one of four surviving Convair B-36s, the only surviving XB-70 Valkyrie, and Bockscar–the B-29 Superfortress that dropped the second atomic bomb in World War II. In contrast to the Smithsonian Institution's National Air and Space Museum, nearly all of the museum's exhibits are extremely accessible. Most are easily touched, even investigated, by visitors. An overhead gallery view of the fourth building aircraft at the National Museum of the United States Air Force including the Boeing VC-137C SAM 26000 (Air Force One). National Museum of the United States Air Force Facts for Kids. Kiddle Encyclopedia.